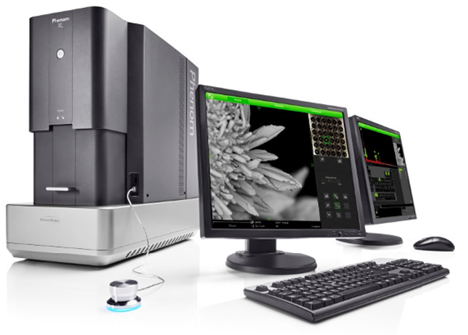 Phenom Pharos desktop scanning electron microscope is the very first desktop SEM that comes with a FEG source to deliver crisp, high-quality images with magnifications of up to one million times. 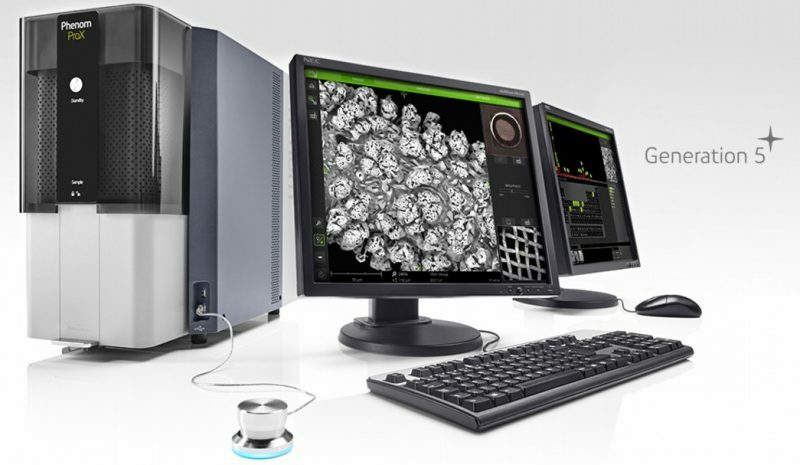 Phenom XL is an all-in- one desktop Scanning Electron Microscope (SEM) that is superfast and easy to use and provides high resolution imaging with elemental analysis of large samples up to 100mm x 100mm. 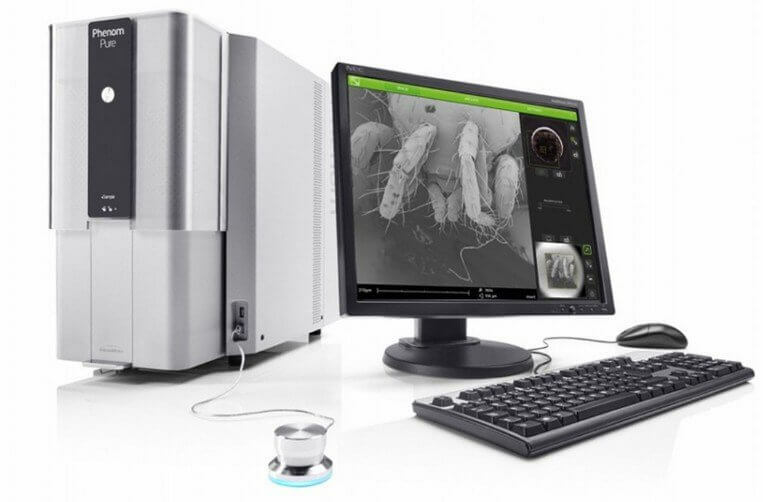 Phenom ProX is an all-in- one desktop Scanning Electron Microscope (SEM) that is superfast and easy to use and provides high resolution imaging with elemental analysis. Phenom Pro is a desktop Scanning Electron Microscope (SEM) that is superfast and easy to use and provides high resolution imaging and analysis. Phenom Pure is an economical desktop Scanning Electron Microscope (SEM) that provides high resolution imaging that is superfast and easy to use. 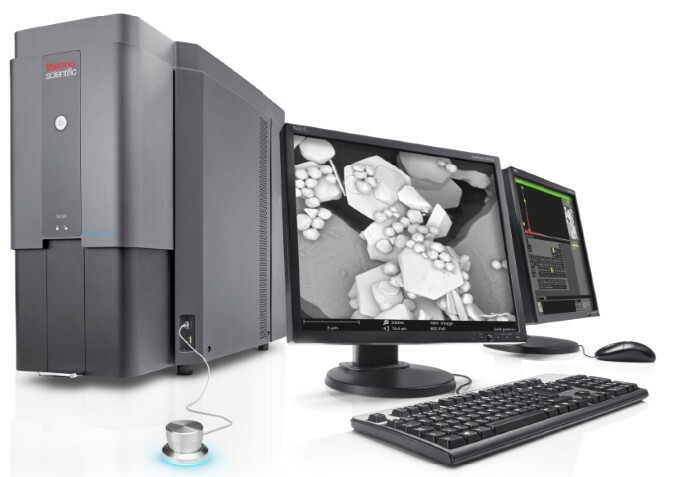 Phenom GSR is a unique, easy-to- use desktop Scanning Electron Microscope (SEM) for automated Gun Shot Residue (GSR) analysis with fully integrated elemental (EDS) detection. 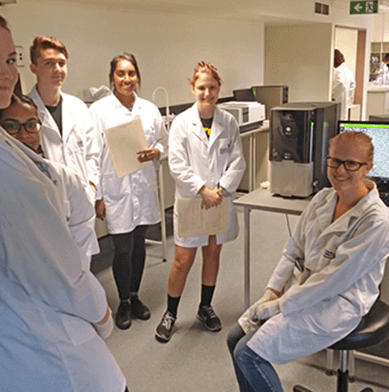 UWS, Advanced Materials Characterisation Facility (AMCF) have installed their new bench-top Phenom XL Scanning Electron Microscope (SEM). There are a number of different imaging techniques. Here are four which cover a very wide range of imaging applications. Desktop SEM. 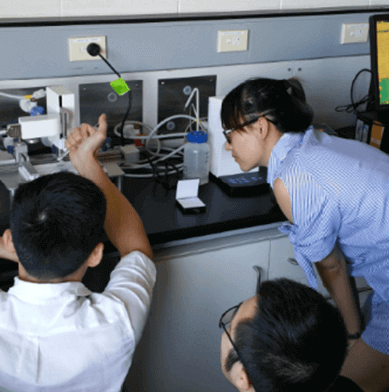 This user friendly tool bridges the gap between the optical microscope and ultra high resolution electron microscopes. 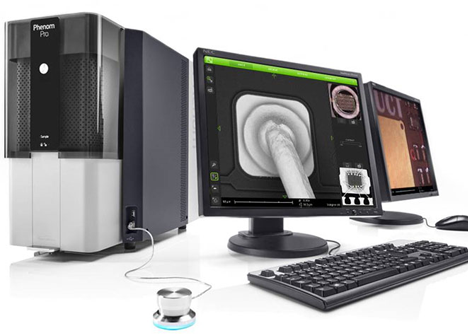 This desktop SEM exceeds the resolution of optical microscopes and eliminates the expense, delay and difficulty associated with operating a traditional SEM. The Phenom SEM is a powerful tool for investigating biological or pharmaceutical samples, forensic analysis and material characterisation. Rapid examination of common engineering alloys (e.g. Al, Ti, Fe and Ni) can be performed in areas such as routine metallurgical analysis, quality control, failure analysis, and research studies. With an integrated X-ray analysis system, sample structures can be physically examined and their elemental composition determined. Particle size: high resolution sizing from 0.5μm – 3000μm. Particle shape: to quantify subtle differences between samples which are not detectable by size-only. Particle count: every particle is measured which enables the system to detect foreign particles. The Malvern Morphology enables hundreds of thousands of particles to be analysed with a single click of the mouse. The ability to see and record an image of every individual particle enables a visual verification of phenomena such as the presence of broken particles, agglomerates, fines, foreign particles etc. A novel fully integrated dry powder dispersion system reduces sample preparation times and significantly improves the repeatability of measurements. Morphologi 4-ID integrates automated size/shape analysis of particles from 0.5 micron – 10 mm with chemical identification provided by Raman microscopy. It provides size, shape and chemical Identification. 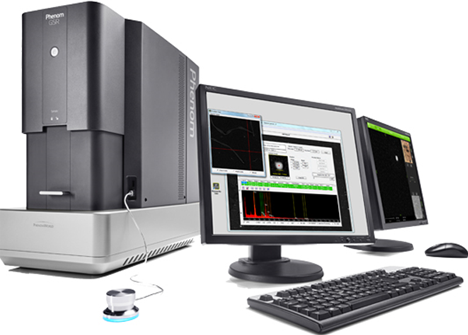 Unlike a traditional Raman microscope, the Morphologi 4-ID with integrated Raman automatically targets individual particles. 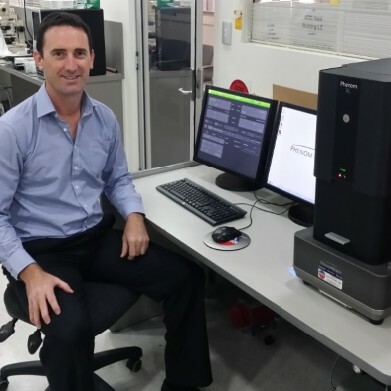 The Livecyte is a unique imaging system for live cell analysis used to study cell functions and behaviour over long time courses. It can reveal the inner details of transparent structures without the need for staining or tagging. Application areas include immunological, neurobiological, cancer and basic cell biology research. 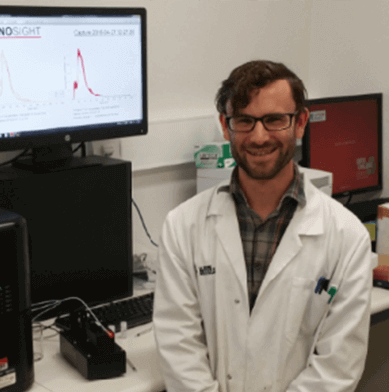 Based on Ptychographic Quantitative Phase Imaging (QPI) technology, individual cells and cell populations can be automatically tracked and analysed for phenotypic and kinetic behaviour over several hours or days. High contrast images and videos can be generated which are artefact free and quantitative in the absence of labels or high intensity light imaging which can potentially disturb normal cell functions. Nanoscale Live imaging. This enables nanoscale surface interaction studies with live imaging and topographic analysis. This label-free system uses patented optical contrast-enhanced sensors (SEEC Sensors) that modify the polarisation of light to allow nano particles to be visualised in static or dynamic mode, in air or liquid. Nanolane N-Lab applications include the fields of life and material sciences. For more information contact us. At ATA Scientific we sell innovative instruments from leading manufacturers in the particle, surface, life and material sciences. Our suppliers include some of the world’s most well-regarded companies such as Malvern Panalytical, Phenom World, Biolin Scientific, Avestin, Jasco, Precision Nanosystems, Phasefocus and Nanolane. Our scientific instruments are used by Universities, the CSIRO and by companies in a range of different industries including the pharmaceutical, polymer, chemical and mining sectors. We also provide our clients with long term support to ensure they get the best out of our products and services. Over the past 27 years, ATA Scientific has provided a range of technical services including operator training, preventative maintenance and instrument breakdown repair. Looking for the most suitable analytical system for your project? Be the first to hear about all our latest articles, products and events.